Baltimore is home to three river watersheds: the Gwynns Falls, the Jones Falls, and Herring Run. All streams and creeks in the city and adjacent counties flow into these rivers and drain into our Inner Harbor. These systems are all part of the larger Chesapeake Bay watershed. These bodies of water vary from backyard creeks to the roaring Patapsco River. We have paved many of these stream beds, or built roads and infrastructure on top of them. Because of these human actions, the habitat available for riparian animals has dwindled. To protect these organisms and enhance water quality we need to protect banks from erosion and provide adequate food and shelter. These can be achieved by planting native water-loving plants and keeping pollutants out of our waterways. Maybe the real reason people tend to think Baltimore Oriole’s are rare, is that they don’t know where to look! Baltimore Orioles forage for insect and ripe fruits at the very tops of trees. They like the darkest, ripest fruits. Find them on stream banks and forest edges, and in your own backyard! 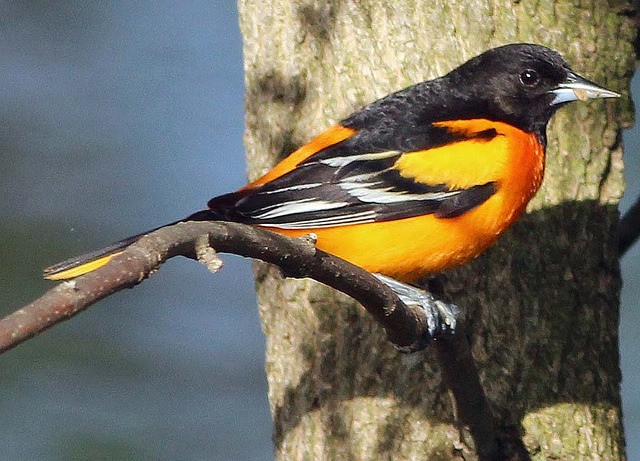 Learn more about the Baltimore Oriole! As their name hints, these small herons are nocturnal, hunting in streams and tidal waters at dawn and dusk for crustaceans like crabs and crayfish. Their breeding habitats are vulnerable to sea level rise, so we need to protect potential inland habitat for these birds relocate to. Did you know that salamanders breathe through their skin and so it has to stay wet all the time, but it produces a chemical that protects it from fungus! Look for them under logs and rocks in woods and near water; and if you can’t find them, you’ll know the habitat quality is decreasing and you need to take immediate action. Don’t worry, they are safe to hold in your hand. Learn more about the Yellow-Crowned Night Heron! Learn more about the Red-Backed Salamander! The caddisfly is well known as an indicator of stream health. They can not tolerate a contaminated stream. What is neat about these aquatic insect larvae, is that they build a protective house for themselves out of whatever is tiny and nearby. Rocks, pebbles, tumbled glass, shells, twigs - everything! Easter box turtles used to be a common wildlife encounter for every child that mucked about in a stream or pond. Sadly, since these reptiles take a long time to mature and only have a few offspring, they are not able to rebound from increased car-related death rates. You’ve probably heard it before, but if you see a turtle trying to cross the road, carefully relocate them to the other side. Learn more about the Eastern Box Turtle!